Alex Patrick is date-raped after a night of drinking and partying. She wakes up with no recollection of the night before, but quickly realizes how serious her situation is. Her friends coax the news out of her and convince her that if she was not conscious she could not have consented, but Alex is reluctant to go to police or the boarding school administration because they have failed students on serious issues in the past. 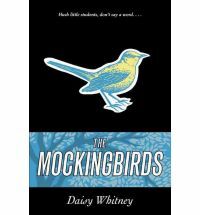 She decides to seek the help of the student run justice system called “The Mockingbirds.” They agree to try the case and things get complicated when the accused vehemently denies any wrongdoing and proceeds to spread vicious rumors about her. Alex begins to wonder if she somehow led him on or was at fault in some way. Does she have the strength to stand up for herself? This book discusses a very serious issue in an open and honest way. Alex’s flashbacks to that night help slowly piece together what happened and shed light on her mixed feelings regarding pressing charges. Her friends and supporters help her overcome obstacles, such as eating in the cafeteria again, and slowly she begins to find the strength she needs. The book is very frank about the nature of the crime and might be upsetting to some students, but it contains an important message and the student justice system is entertaining.